First off, I have to say that I am getting tired of SyFy site winking at bigotry. Known Bigot Orson Scott Card has released a never game called Shadow Complex. 200,000 people either didn't know or didn't care that this bigot was behind the game and purchased it! SyFy's Fidgit turned this into a joke... and people like me are just getting tired of fighting this fight. I wish I could crochet! 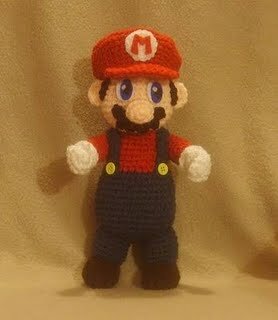 I really want to make one of these Mario Plushies. It is odd. I can knit, but crochet is far beyond my abilities. Mario is one of my favorite video game characters, and this plushie is one of the cutest things I have ever seen. Full instructions can be found at Wolfdreamer Off the Hook. 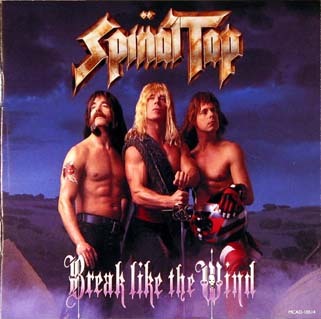 More Spinal Tap music is available to rock you! via The Real Spinal Tap Hits Rock Band - GayGamer.net. 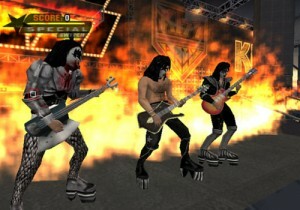 Three new Kiss songs are up on Rock Band DLC! Time to dust off the guitar and drums and get playing! Sephiroth/Aerith Tribute- "The Mourning Tree"
I found this video by accident while looking for a video of the Leaves' Eyes song "Mourning Tree" to share on a forum. This is one of my favorite songs, and I have always been surprised that more videos haven't been made using it. I would love to see a Richard/Kahlan video, or a Daniel/Sha're video. This one on Sephiroth and Aerith from Final Fantasy VII is an interesting way to frame the story from Advent's Children. After all it really is their story isn't it. Mass Effect 2 Teaser, Don’t delete your saved game! I loved Mass Effect with a fever I haven’t felt for many games. The above trailer for Mass Effect 2 sent chills through me and my mind is already racing. I have to know what happens to Commander Shepard. "This is just your first taste of Mass Effect2. We are not yet discussing the details of the game… However... don't delete your Mass Effect 1 saves yet (Video Gamer)." I assume that means we will be able to pick up where we left off, or maybe they are going to take into effect the choices we made in Mass Effect to establish how the characters react to the players. I cannot wait to play. 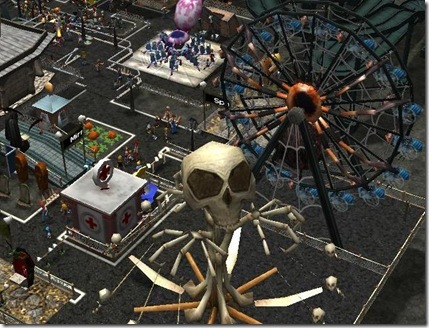 Even though Roller Coaster Tycoon 3 is a few years old, I keep coming back to play it. I love the wide variety of game play you can have. From sandbox mode where you can do whatever you like and have as much money as you need, to career mode where you have tasks you must complete. This game is hours of fun. I've always been impressed with this company's attention to detail when it comes to theme rides and decor. 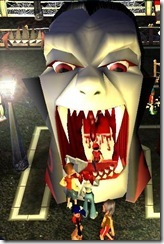 Even with the first edition of RT, they gave you the opportunity to pimp out your park with horror-themed shops and scenery. A new thing with this version is that you can make your janitorial staff match your theme. 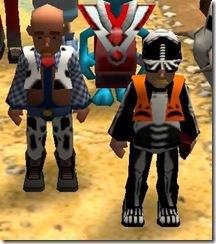 We used to be able to change the color of their outfits, but now you can make your janitors wear western or skeleton overalls. They must have had real horror fans creating this version because the visuals leave no spooky stone unturned. From the Blood Shake Booth to the pumpkin head entertainers, these visuals are horrorfying. They have options for you Sci Fi fans too. 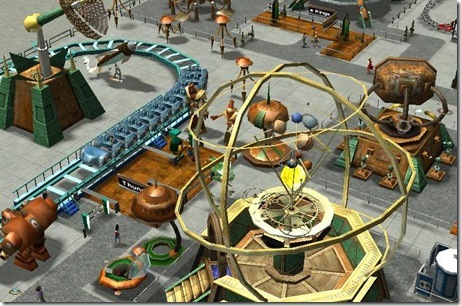 Including a steampunk-like planetarium, robots, spaceships, and even an alien entertainer. For those of you who tend to migrate towards water parks, they have a massive pool complex library that you can create large pool complexes with including diving boards, hot tubs, showers, slides, lifeguards, and wave pools. Once you build one of these puppies, the customers flock to your park in droves. The walkways and ride add-ons are slightly difficult to maneuver at first, but once you discover you can make multi-level pools and large sunbathing areas, you'll be hooked! Don't forget to put an Inflatable Stall just outside the changing rooms so that your people can ride around the pool on alligators, dolphins, and turtles. The way these two separate items work together is just one of the ways this version is more "real". They did not leave you country folk out. There are dozens of western rides and attractions including animatronic cowboys, Indians, and banditos. If you set them up properly, they will have a shoot out across the paths. There are only a couple of technical issues with this game. The first is when it becomes nighttime. For some reason the game will slow up. It seems to get worse if you have a lot of lamps installed. The second is when you get over 3000 people in your park and build a lot of intricate rides over a large space. Considering how graphics intensive this game is, it's not hard to imagine why. With so much activity, the computer has difficulty keeping up. I've enjoyed this game on Windows 2000, XP, and Vista and these are the only two bugs I've found. This game is by Atari and is rated E for everyone, so gather the family and spend a night creating your dream theme park. But I warn you... this game is highly addictive. You can purchase Roller Coaster Tycoon 3, by clicking this Amazon portal. Free Radical Design has found financial sanctuary in German developer Crytek, who is reported to have purchased the struggling Nottingham, UK dev for an undisclosed amount (Kotaku via Gay Gamer). What this means for the future of Battlefront 3 in unclear, but its chances for release have gotten better. Let us all collectively use the force to mind trick some game company into buying Free radical, because if the gameplay video wasn't enough to make you want to play Star Wars: Battlefront 3, this concept art of a Sith Obi-wan should be! Rumor: Battlefront 3 Video Leaked? I really want to see Battlefront 3 hit the shelves, and after watching this footage which promises the game for the XBox 360, PS3, and PC, I want to play it all the more. But there is one tiny hitch in the plan… Free Radical, the company making this game, is on the auction block. Hopefully, someone will buy up Free Radical, or at least the code and developers for this game. If not, this may be the best Star Wars game you never play. 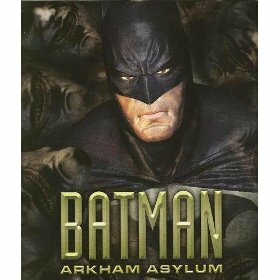 The video game Batman: Arkham Asylum will have Mark Hamil as the voice of The Joker. I'm so excited about this news. Mark Hamil's Joker is one of the best jokers ever!!! Mark Hamil was the Joker in the 1990's Batman - The Animated Series television show. I wonder if they will put in Harley Quinn too. With his contribution this game will rock even more!!!! 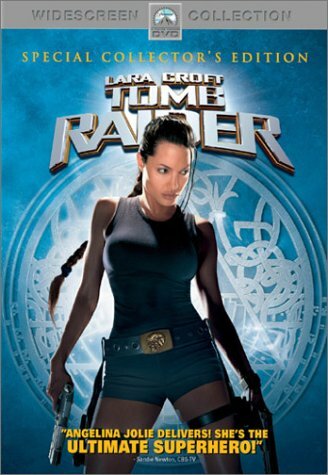 It will be released on the x-box 360, PLAYSTATION 3, and Windows Vista / XP. You can preorder your copy here! Auron is one of the most interesting character in Final Fantasy X. His sinister attitude and life of secrets added so much to the game. This wonderful costume from Otakon replicates the look fairly well. I especially love the sword. I have collected many blades in my life, but the one thing that has always been missing from my collect are some life-sized Final Fantasy blades. Perhaps, one of these days when I have the house of my dreams, I will have a salon or lounge filled with the art of people like Alex CF and a nice set of fantasy weapons. Or maybe I will just start a chain of fantasy themed mead halls from people like to enjoy a drink and some geeky conversation. Captain Robert - Steampunk Firearm - Abney Park Airship Defender - A beautiful sidearmd for the Captain of the HMS Ophelia. Voltron: Defender of the Universe Goes Into Turnaround - SuperheroFlix.com - I cannot help but giggle. New Watchmen Images Here! - The more I see, the more excited I become. He-Man Film Will Go for Realism - SuperheroFlix.com - This will either be a recipe for success or failure. Death Star over San Francisco - Project: Shadow HQ - This looks really good. I wish I had the time and the talent to do vids like this. What is a Fair Price for an E-Book | dashPunk - Brian sets out our policy, what do you all think? DVICE: Star Trek Command Chair makes anyone feel like Captain Kirk - I want one of these so bad, but I don't know why. Perhapse it is delusions of grandure. Warner Bros. announced Wednesday it will release an episodic downloadable video game developed by Deadline Games that will prequel next year's big-screen adaptation of the "Watchmen" graphic novel pegged to the film's March debut (AP). This is an interesting idea. I am not sure exactly how this will work out in real world. I hope they are able to pull off the story elements and especially the game play and cost. 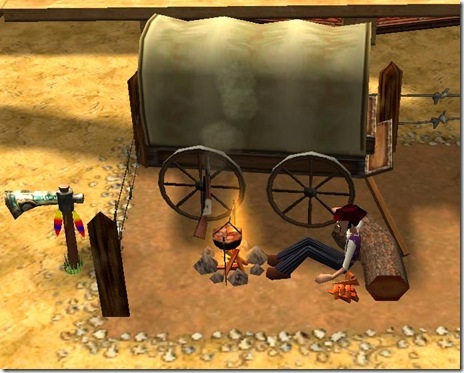 Deadline Games is developing the game for the Xbox 360, PS3, and the PC. This is an interesting idea and it could really help bring people into the setting, but if the quality of the game is on par with most movie related games, it could have the exact opposite effect. While vying for similar audiences at the same time, "Grand Theft Auto IV" bested "Iron Man" by about $300 million in their respective first weeks on the small and big screens. The highly anticipated video game about immigrant gangster Bellic drove away with over $500 million, while the movie about Marvel billionaire superhero Stark blasted off with over $200 million worldwide (Yahoo! News). Let us now sit down and compare Apples to Oranges. I understand that there is very little going on in the entertainment industry right now to write about. The economy is in bad shape, we are suffering through another revenge of the sequel summer, and very few artists are doing anything to excite the desperate bloggers and journalists who have deadlines, but this is not a story. Now, I know these are nor accurate numbers. Brian and I only paid $5.50 each to see Iron Man, but the moral of the story is more people experienced Iron Man than GTA. I now return to my original point: How is this a story? There is absolutely no reason we should be comparing receipts for two products that are not in the same market and when one of the products average cost is 10 times higher than the other. Apples and Oranges. Knights of the Old Republic Online? There is a lot of wishful thinking at the heart of the rumors going around. 10/30/2007- 1Up Reports that Bioware and LucusArts are working on a new "ground-breaking interactive entertainment product." The logical question for all of the Knights of the Old Republic fanboys like myself is, "What could be a more compelling than a Knights of the Old Republic MMO?" I have been craving a new KotOR game for a long time. In fact, that is why I started playing Star Wars Galaxies. I really wanted more Star Wars and hoped Galaxies would fill that need. For a long time it did... until chapter 6 was released. The game became for the most part unplayable. No one wants a new Knights of the Old Republic Online than I do, but these rumors are even less than a whisper and a prayer. I can only hope that is game is actually coming, and that if not, if we dream openly about it enough, perhaps the stars will align and this game will be made. I will be keeping my eyes on this and hoping that something more concrete evidence of the games existence. 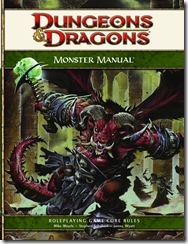 To start with, the digital initiative, which is called Dungeons & Dragons Insider, will, for the first time, make it feasible to play a game of D&D with your friends over the Internet and without having to pull out the thick, iconic, hardcover books that have for so long been an essential element to the experience. That makes my whole body go woo! I would love to run some of these games. There are no details about pricing or game mechanics as yet, but the idea of setting up stories that can be played online is a thrill. I have tried several virtual table tops, but none of them have been worth the price. The images I have seen from the D&D Insider character generator are exciting and the reported customization options thrill me. I am curious to see how easy the dungeon maker is to use, and what level of control and how time consuming the DM tools are to use. I wonder if it with have a voice chat built in or if Skype or something else along with it. I signed up for the game which in not available for download yet. Finally, something in gaming to get excited about. It looks fun, I just hope it comes out for the Wii on the same day. I cannot wait to play this game, the new picks are nice. This spoof trailer for a Zelda movie really makes me wish they were doing an actual film. Great April fools, Thanks Bill! I love this song, Petula Clark is a treasure. Great 1974 concert clip of Sabbath live. I love this song! DREAM THEATER AND OPETH JOIN FORCES!